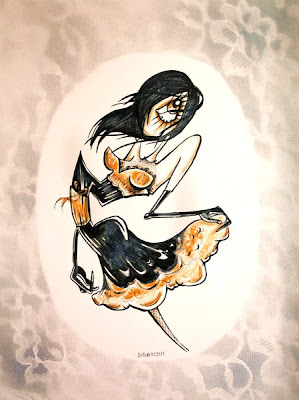 We love Kasey's One Eyed Girl series of drawings and were delighted when she offered to create one for our giveaway. This One Eyed Girl is edgy and romantic, a little bit of what PDR is all about. Interested in your own custom One Eyed Girl? Send her an email to commission your very own piece. And, be sure to visit her website and her blog to check out Kasey's other work and to save the dates for any upcoming exhibitions. Paralyzed artist since 2000! I'm a paraplegic thanks to an AVM on my spinal cord, but that hasn’t stopped me from my 3 favorite things: traveling, (most recently) surfing, and (most importantly) creating! When did you first know you wanted to be an artist? When did you get started? I've loved doodling and creating since I was a child, it always my favorite hobby. I can't remember a time of wanting to be anything but an artist. I took every art class in high school, got my Bachelor's in Fine Arts, and have been making and showing art ever since. For me, there's nothing better than painting and sculpting. I love the mess of paint and clay covering my hands, even though it never seems to come off and gets all over everything else I own. Much of it comes from my disability, dealing with it, expressing it. Other comes from my own personal mission to amuse myself (and I guess sometimes others). I love creating characters in 2D and 3D that are just funny, weird, cute, and unique. Do you have any advice for others that are looking to sell their work? Create like crazy and love what you do. It doesn't happen overnight! Congratulations to Rachel and special thanks to the talented Kasey Tararuj for her generous donation! Oh my gosh this is amazing and such an honor to win something from such an extraordinary individual! Thank you!!! !